Showing 19 articles from July 21, 2014. Local resident and community leader Georgia Cox served as Grand Marshall during the Castle Rock Fair Parade Thursday evening. Cox works with the Castle Rock Senior Center and was named Volunteer of the year by the Sunnyside Grange in April. Popular Head Basketball Coach and Toledo Middle School Teacher Scott Merzoian has resigned to accept a teaching position at Longview's Monticello Middle School, closer to his residence. Merzoian was the head Toledo Basketball Coach at Toledo High School and had a win record of 290-118 during his career and was part of nine state trophies that returned to the high school, including a state championship last year. The Winlock Lions Club is getting ready for a Back to School Bingo for kids on Aug. 20 and donations of school supplies are being sought in the mean time. Scheduled to take place at the Community Building, the event will be free to enter, save canned food donations gathered at the door for the Winlock/Vader Food Bank, and will feature prizes of school supplies for kids in attendance. Local resident and Vader Lions Club member Kathy Crawford has been named the governor for District 19G, and has been described as the first club member from South Lewis County to do so. Installed as governor during the Lions International Convention in British Columbia on July 1, Crawford said she is looking forward to meeting with area clubs and helping them achieve the goals for their communities. Portland-based juggler and physics aficionado Rhys Thomas (background, center) was on hand Thursday at the Winlock Timberland Library to teach children, and several adults, the basics of Newtonian physics and its role in our everyday lives. A newcomer to the cadre of performers to visit Winlock, Thomas’ show was part of the ongoing summer reading series, whose theme this year is “Fizz, Boom Read." Members and Supporters of Lions Club International march in the 41st annual Napavine Funtime Festival Parade Saturday as the Winlock Lions Club seeks to sponsor the formation of a club in the Napavine area. With seven members committed to joining and a prospective 15 having expressed an interest, the club is well on their way to gaining the 20 members needed to be given an official charter. The Cowlitz Valley Runners will be holding Mt. Mania in Castle Rock this Saturday, with activities planned for families as well as runners of all levels. Three age categories will compete for prizes (10 and under, 11-15, and 16 and up) as well as “King and Queen of the Mountain” bestowed on the first male and female to reach the top of the large hill in the middle of the course. Members of the Ryderwood community gathered around the Memorial Garden Wednesday for the dedication of a new flagpole at the site, as well as the ceremonial retirement of unserviceable American flags. Led by members of VFW Post 7010, as well as AmVets, credit for installation of the flag was given largely to resident Sharon Anderson, who has been in charge of maintaining the Memorial Garden for the last few years. Vision:Toledo will be holding their third annual Steelhead Derby this Saturday and residents from throughout the area are encouraged to come and compete for prizes and the title of best angler. Scheduled to begin at 5 a.m., fishermen and women of all ages will be able to participate from any position they’d like along the Cowlitz River (some locations are a little more secret than others, so be careful who you share yours with) and should bring their catches to be weighed at the Toledo Boat Launch no later than 4 p.m.
Toledo New Life Assembly will be hosing their third-annual SumerFest this weekend at Toledo Middle School, with events and entertainment open to the public. Starting at 11 a.m. Saturday and running until 5 p.m., this family festival will feature live music, food, hay maze, dunk tank, live animal show and fun games, while words of inspiration will be offered throughout the day. 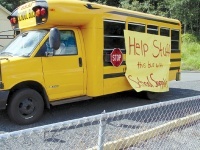 Local residents are being encouraged to help collect school supplies for Winlock’s "Stuff the Bus" program taking place later in August. I’m borrowing much of this week’s article from a gardening piece that will appear in the August Ryderwood newsletter. The timing is appropriate for what’s happening in the garden these days. Enjoy the fruits (and vegetables and flowers) of your labors. “Deep watering in the morning and late afternoon needs to be done in the scorching mid-summer heat; containers and hanging baskets may need daily watering. Composting class 6 p.m. Wednesday, Toledo Senior Center. Chair Yoga returns Sept. 9. Seats for those under 50 as well. Contact Diana, diana.haug@lewiscountywa.gov or (360) 864-2112. Tuesday vision:Toledo Arts, Rec and Events meeting 6:30 p.m. at the Morgan Arts Center. 30th Bluegrass Festival Aug. 8-10, 50th Threshing Bee Aug. 22-24, 15th Cowlitz Pow Wow Sept. 20, ARTrails Sept. 20-21 and 27-28. Events calendar at www.visiontoledo.org. Visit www.morganartscentre.com or call (360) 864-4ART. Our community organizers are at it again with their annual City-Wide Yard Sale coming up Aug. 2. Made up of dozens of residents holding their own yard sales on the same day, participation is on an at-will basis, and last year’s participants took home an average of $100 apiece in sales. Sales are expected to begin at 8 a.m., and the Vader Park Board will make a showing with hotdogs for sale. To get your home marked on a map to be handed out during the event, contact organizer Judy Costello at (360) 295-3036. Thank you for all your kind thoughts and prayers as I continue my stay at Swedish Cherry Hill. They continue to "practice" medicine with the growth and clots on my heart and lungs...thank you again and please continue with your prayers !! Cowlitz County Fire District 6 has begun looking at the possibility of proposing an EMS levy to voters during the November election amid projections of financial distress for the district’s future. Based in Castle Rock, district commissioners met July 14 during their regular meeting to discuss proposing a property tax of $1 per $1,000 of assessed value, intended to help keep the agency from folding. A Winlock woman has been cited after causing a collision near Chehalis Friday, according to the Washington State Patrol. The 18-year-old driver of a 1999 Ford Range had been traveling west on SR 508 near Milepost 3, southeast of Chehalis, when she drifted to the right, then overcorrected and crossed the center line, striking head-on an eastbound 1993 Toyota Camry driven by a 63-year-old Onalaska woman. Authorities are seeking help solving a burglary in Chehalis back in May. Local fire and EMS calls between July 14 and 20.